Barack Obama and Hamid Karzai press conference: The president is pulling U.S. troops out of Afghanistan while changing the reason why so many soldiers were there. If there were any doubts, President Obama’s press conference today with Afghan president Hamid Karzai should dispel them: We are so out of there, at least as a full-bore fighting force, and sooner than previously scheduled. Obama spun the news as a victory lap. “It will be a historic moment,” he proclaimed, “another step toward full Afghan sovereignty.” That’s one way to put it. What Obama didn’t mention is that this surge and this strategy were not a success. He’d treated the strategy as an experiment; he gave it 18 months to work, and his generals assured him that would be enough time for the Afghan military to take the lead in a majority of the country’s districts, even though some of them knew very well it would take longer. They gambled that enough progress would be made to convince the president to give them more time and more troops. They gambled wrong. After 18 months, almost to the day, Obama announced that he would start pulling out all 33,000 surge troops—and not replace them with any new ones. This too he publicly presented as a victory, and by the same rationale: bin Laden had been killed, al-Qaida decimated, Taliban foot soldiers routed. But the goals of the surge—the goals of the counterinsurgency strategy—had not been accomplished. Obama simply—and wisely—rejected them; the experiment was over; he wasn’t going to double down. Some officers and analysts blame Obama for the failure. They argue that by announcing the beginnings of a troop pullout before the surge even began, he signaled to the Taliban that we were leaving and that they could simply wait us out. There might be something to this argument. But the bigger, central problem was with Afghanistan itself. Of all the foreign leaders installed by Western powers in the last 60 years, Karzai has been one of the most frustrating. In 2009, the U.S. ambassador, Karl Eikenberry, complained in a widely leaked memo that Karzai was “not an adequate strategic partner.” A year later, after one of the Afghan president’s more petulant fits, the top U.S. commander, Gen. David Petraeus, threatened to pull his support for the mission, telling one of Karzai’s advisers, “Your president has put me in an untenable position. Please take note of that word. I chose it carefully.” Karzai calmed down, for a while. The problem wasn’t so much Karzai as the politics, the demographics, even the terrain of Afghanistan. Counterinsurgency doctrine, which Petraeus had long promoted and which Obama provisionally endorsed, holds as its premise that insurgencies rise when the local government loses its legitimacy among the population, often because it fails to provide vital services, justice, or something else that the people demand. To win an insurgency war requires not just killing and capturing bad guys but helping the government regain legitimacy—which, in turn, would dry up the people’s support for the insurgents. David Galula, a French colonial officer who wrote a 1962 book called Counterinsurgency Warfare (which its adherents treat as a sort of bible), calculated that these kinds of wars were 80 percent political and only 20 percent military. Afghanistan proved to be less-than-fertile ground for that 80 percent. In fact, Galula’s book contains a chapter titled “Prerequisites for a Successful Insurgency.” They include a corrupt government, a largely rural and illiterate population, a bordering state that serves as a sanctuary for insurgent fighters … from top to bottom, it’s a portrait of Afghanistan. Galula even draws a sketch of what an ideal country for insurgency would look like; it’s a dead ringer for Afghanistan. During the behind-doors sessions that Obama and his top national-security advisers held over Afghan-war policy all through the latter half of 2009, Vice President Joe Biden was the only one in the room who argued that counterinsurgency wouldn’t work: It would take too long and cost too much; the American people would lose patience. It was better, Biden argued, to focus on attacking al-Qaida and Taliban soldiers along the Afghan-Pakistani border—and on training the Afghan security forces, so they can carry on the fight after we leave. The generals argued that this wouldn’t work, that we also needed to change the conditions that created the insurgency. (As Galula wrote, it wasn’t enough to swat the fleas; you needed to drain the swamp where the fleas were bred.) Secretary of State Hillary Clinton further argued that the American people would support the war if results were achieved. Clinton and the generals were right in theory, but Biden turned out to be right in practice. The policy that Obama now pursues—and has been since the middle of 2011 (that is, 18 months after he put the counterinsurgency experiment in motion)—is essentially Biden’s policy. Obama did not say today—probably because he hasn’t yet decided—how many troops, if any, the United States will keep in Afghanistan after 2014. The military wants at least 10,000. Some in the White House are reportedly talking about 2,500 to 6,000 or perhaps even zero. The more basic question is what the president wants the troops to do. His national-security spokesman, Ben Rhodes, told reporters today that the missions will continue to be dismantling and defeating al-Qaida, training and equipping the Afghan security forces, and conducting counterterrorism—that is, going after Taliban militias along the Pakistani border. If U.S. forces are going to do all of this, 10,000 is probably a minimally reasonable number; if the Afghans are going to do the bulk of counterterrorism, the number could be much smaller. Are the Afghan soldiers and police ready to take on the burden, not just in 2014 but, as Obama announced today, this spring? It’s unclear. 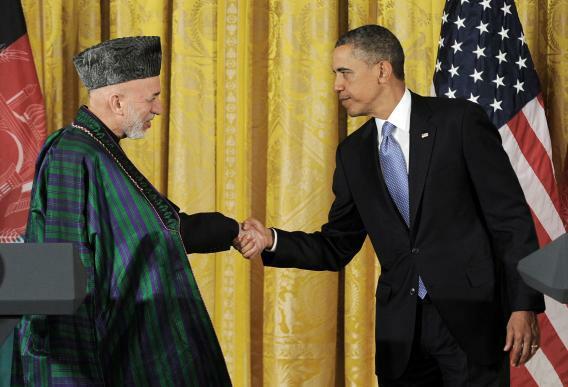 But for too long now Karzai has been allowed to play a game, not just with Obama but with George W. Bush before him. He has been convinced—by the talk and action of these presidents and their military commanders—that the United States has more at stake in the war than he does; that he can therefore keep playing his domestic power games, and abetting his network of corrupt ministers and district officials, and we won’t do anything about it. Back in 2009, Obama announced when the pullout would begin at the same time that he announced the surge, as a way of telling Karzai he had to get serious about reform. Karzai didn’t take it seriously. Now he must. Whether it’s too late, we’ll soon see.